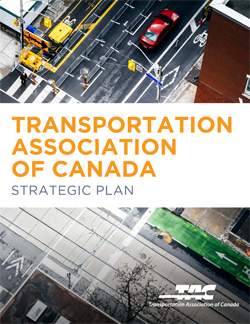 The Transportation Association of Canada (TAC) strategic plan reflects the Association’s priorities and guides its initiatives. The plan is dynamic and rolling, and subject to annual review and update. 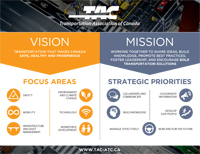 The strategic plan was built on the foundation of feedback received from TAC’s members and stakeholders in 2016 through surveys, interviews, focus group sessions and a town hall meeting held as part of the 2016 conference and exhibition in Toronto. Focus Areas that describe core interests of TAC’s councils and committees. Strategic Priorities that guide the contents of TAC’s operational plan, which further details both ongoing activities and a variety of new initiatives. Both the full strategic plan, and a 1-page overview version are available.